From the portable bar — The other day, the Taller than Average Woman sent me a recipe for a cocktail she invented that called for 99 Blackberries, which I had never heard of. Turns out it’s a blackberry flavored schnapps made by the Sazerac Company, and that got me to thinking that I hadn’t heard anyone mention the Big Easy’s favorite potable, the Sazerac cocktail, in a very long time. Now, as it involves rye, the spirit of the moment among liquor cognoscenti, I presume the Sazerac (I just love the sound of that, don’t you?) has made a resurgence and I’m just not up to speed. As a rule I avoid bars where the bartender is called a mixologist and there’s an excessive amount of muddling going on. Well truth be told, I might perhaps have worn out my welcome in one or two of them, but that’s a story for another day. The Sazerac can be made with either rye or cognac, and I won’t lie, I tried it both ways, fully expecting to prefer the Remy Martin option. Surprisingly, I liked the rye-based cocktail better. It was less sweet, though you could certainly cut back on the sugar if you were going to use cognac. I was also skeptical about the Pernod, as licorice is among my least favorite flavors and Pernod conjures up visions of stinky old men in berets sitting around cafés, smoking and grumbling and hawking up big gobs of goo the color of their pastis that land on your pretty new shoes and make you cry. 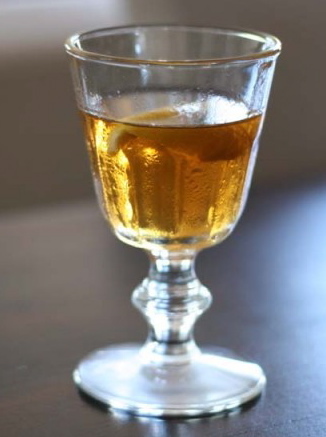 According to the Sazerac Company of New Orleans, the modern day Sazerac Cocktail recipe calls for 1 cube of sugar, 1½ ounces of Sazerac Rye Whiskey, ¼ ounce of Herbsaint, 3 dashes of Peychaud’s Bitters and a lemon peel. One Old Fashioned glass is packed with ice. In a second Old Fashioned glass, a sugar cube and 3 dashes of Peychaud’s Bitters are muddled. The rye whiskey is then added to the sugar/bitters mixture. The glass now containing sugar, bitters, and rye whiskey is packed with ice and stirred. As the second glass is stirred with one hand, 1/4oz of Herbsaint is added to the first glass, still packed with ice. This glass will be rotated with the second hand, while maintaining a stir in the first glass. The ice and Herbsaint is emptied from the first Old Fashioned glass. Any excess Herbsaint is discarded with this move. The rye/sugar/bitters mixture is then poured into the Herbsaint coated glass and the glass is garnished with a lemon peel. The bartender then collapses in a state of panic-induced exhaustion and throws back the entire drink himself just to keep from screaming. Fill an old fashioned glass (or a cocktail glass, or a martini stem — whatever you like) with ice and set it aside. Into a cocktail shaker pour 3/4 ounce of simple syrup and three good dashes of bitters (I used regular old Angostura), then swirl it around. Add 3 ounces of rye or cognac to the shaker and swirl it around. Dump the ice cubes out of the glass and pour a little Pernod (Herbsaint or even absinthe if you have it, you naughty hop head) into the cold glass, swirl it around and dump it out (or drink it if you’re the thrifty type). Pour the rye/cognac mixture into the glass, add a twist of lemon peel and sip. Posted on February 2, 2012, in Cocktails!, Party! Party! and tagged Bitters, Cocktails, Cognac, culture, Entertainment, Humor/Commentary, New Orleans, Recipes, Rye, Rye whiskey, Sazerac. Bookmark the permalink. 19 Comments. Lets see, it’s past noon, and it’s Friday…cocktail hour, here I come! With such inspiration, how could I not venture to the kitchen for a little booze to help me through the second half of the day? Nothing like a little whiskey and sugar to grease the skids and ease the transition to the weekend. Not that I’d know anything about that…Thanks for reading! Wow, you like and know how to make a Sazerac?! I’ve now gone from *admiring* to *worshiping* you. Wow! My little – and pathetically simple and boring, by comparison – cocktail recipe inspired this? Impressive. I’ll have to pull this one out when I’ve got some guests over who can truly appreciate the art form. Quite the Picasso, my dear! You had me at blackberry schnapps. I’m so happy not to be the only cheap date in town. That’s an awesome kit! ive actually seen an emergency cocktail-making kit that you mount on the wall. pretty insane. 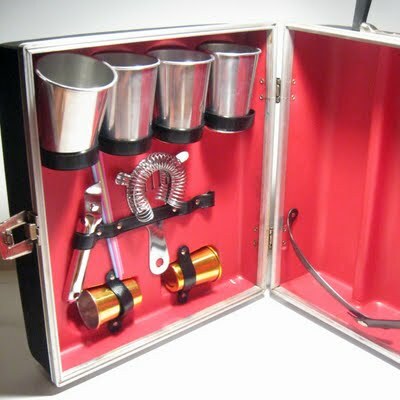 An emergency cocktail kit? Really? That is just…I can’t even find the words…beautiful.